Cooking Time: Most of the time is the eggs soaking. Soft boil eggs.Prior to cooking, leave the eggs out at room temperature for 15 minutes. Place the trivet in the Instant Pot and place the eggs on it. Fill water to just under the trivet. Set the Instant Pot to Manual for 4 minutes on High Pressure. Once done, quick release and immediately put the eggs into an ice bath. The ice bath immediately stops them from cooking. To prepare the eggs, take a spoon and gently evenly crack the shells of the eggs. Emphasis on gently. The Instant Pot has a way of preparing the eggs in such a way that eggs are easily de-shelled. 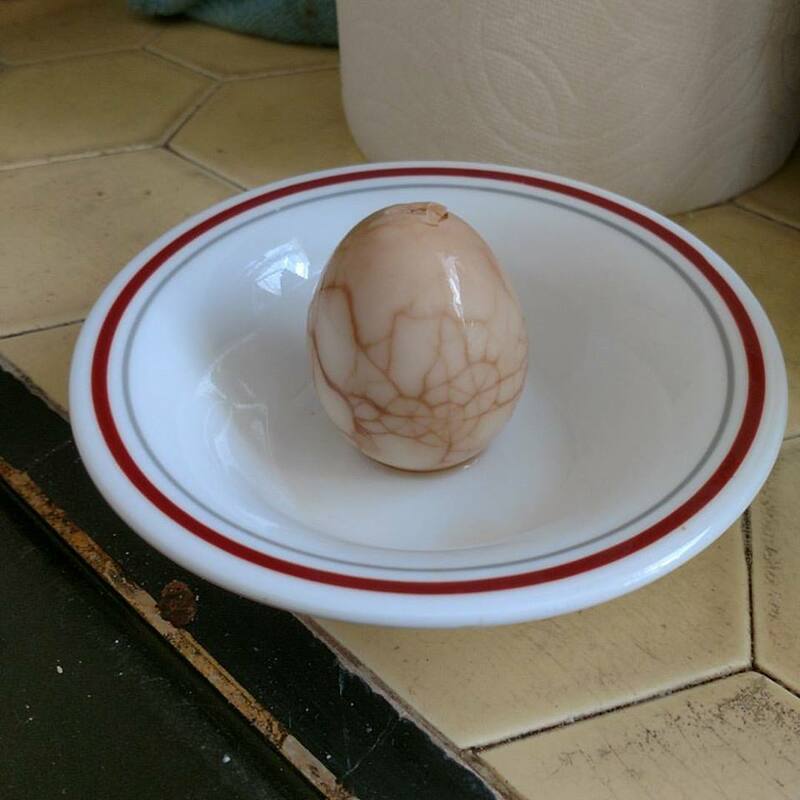 I actually had a whole egg de-shell itself while it was being boiled in the marinade. Dump out the old water, and lightly clean the Instant Pot liner. Add 5 cups of water and bring to boil (Saute on High). Cover with a lid to boil water quicker. Add the tea bags and brew for 5 minutes. Next. add the peppercorn, brown sugar, star anise, and cinnamon and brew for another 5 minutes. Add soy sauce and bring to boil. Once at a boil, add the cracked eggs back in and continue to boil for 5 minutes. Lower the Instant Pot to a simmer. To do this, press the Keep Warm/Cancel button, and then set for Saute on Low (Saute, Pressure [Set to Low by hitting the minus (-) button], wait 10 seconds). Cover 2/3 of the Instant Pot with a lid to keep the marinade at a nice simmer. Simmer for 20 or 30 minutes. Once done, turn-off and set aside. For best results, leave the eggs in the marinade for 36 hours. This time measurement isn’t exact. Please play with it to get the desired flavor. At a minimum, let it soak over night (9 hours). This provides a more mild taste. A soak of 2-3 days will provide a more prominent flavor.I ended up placing the eggs in Tupperware and covering them with marinade, then storing them in my refrigerator. The remaining marinade, I stored in separate Tupperware and froze it. Save the marinade for future 1 or 2 tea egg batches!